Today we head off to Columbus for the annual TNNA (The National Needle Arts) Convention. This will be my first time going as an exhibitor - for Momogus Knits patterns of course. I was really scared for a while, but now that it's getting closer I'm calming down. 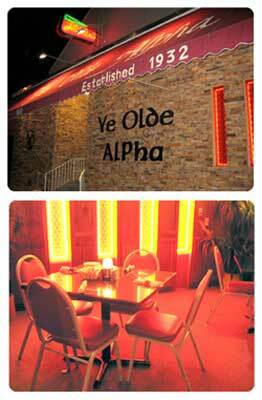 I saw on the website that the Alpha's menu has a distinctive Greek flavor now, so it must have been sold. When I worked there, a family came in and asked if we had any fried food, and I replied, "At the Alpha, EVERYTHING is fried!" As you can tell from the photo above, its beautiful and extravagant decor has remained the same. I LOOOOOOOOOOOOVE Wheeling. The year that I spent there was one of the best of my whole life. Definitely in the top 2! I haven't been back in 10 years though, so I'm anxious to see if it's changed at all. I promise you I will bring back lots and lots of pictures! Wish me luck in Columbus!!! I'm sure you all will have a wonderful time, and I know MomogusKnits will be a big hit in Columbus! My only worry is the difficulty Matthew may have in prying you out of Wheeling. But of course you're stopping there on the way back, too. So that should be OK. I LOVE West Virginia too because of our visit. Please say hello to the Butter Thief for me!